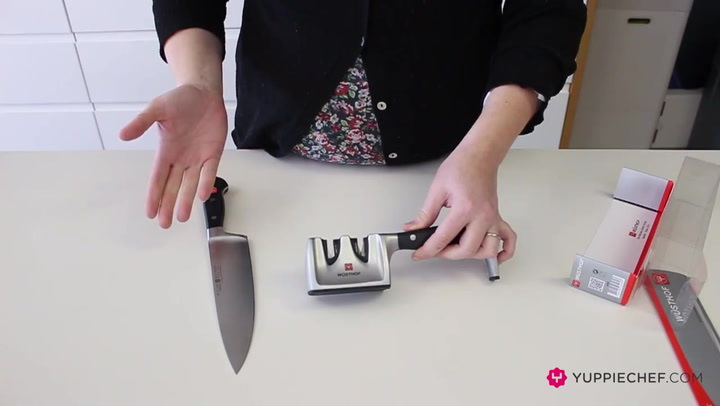 This innovative knife sharpener is perfect for left and right-handed use and has two levels for sharpening knives, depending on how much cutting performance has been lost. Use the first level, coarse, for when the knife is blunt, and the second level, fine, for fine sharpening following on from the first level or for regular resharpening of the blade. The ceramic slats grind the blade and the knife regains its original sharpness. I am very happy that my old knife sharpener broke otherwise I would never have discovered this great product. Now even my old knives that never seemed to get sharp with my old sharpener, are now sharp. This is an outstanding sharpener. It brings blades to razor sharpness easily and safely. It grinds at a 100% consistent angle which ensures that every time you glide your blade through it sharpens cumulatively. In my view safer and easier to use than a sharpening steel and, unless you are quite practised with your steel, probably better results. Brilliant! No more blunt knifes in my kitchen. In comparison to the sharpening rod this item affords security in terms of safety provided used on a level surface. It is simple to use and highly effective even on serrated knives. Never a blunt knife in the house! Solid as a rock, easy to use and sharpens like a dream! I sharpened all my knives the moment I unpacked it! Old knives that I thought were beyond help sharpened up within seconds. It's a must have for every kitchen!